A Whisky Made By People Not Software; A Whisky Watched Over Every Day Of It´s Maturation Life By Those Who Made It; A Whisky Born Of a Community, Of A Vision And A Burning Desire To Kick- Start A Single Malt Whisky Revolution , This Port Charlotte 10 Year – Old Is Who We Are . This Is Wehre We From. We Are A Young Team With Deep Rooted Values, And An Ambition To Make The Ultimate “ISLAY” Islay Whisky. 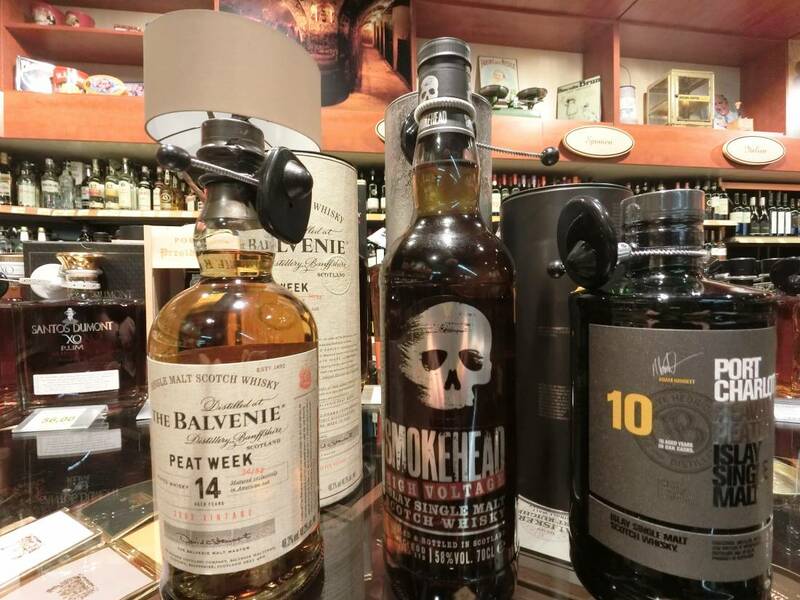 The Balvenie Peat Week – 14 y Old – Single Malt from Dufftown – 0,7 l Bottle -48,3 % Vol.Alc. Today at The Balvenie Distillery we burn peat to dry our barley, as we have always done, but for one week every year we use heavily peated barley to make our spirit. Gentle sweet Peat Smoke on the nose with some floral notes an delicate butterscotch honey. Velvety an round to taste wth the peat smoke balancing citrus flavours, okay vanilla and blossom honey. This finish has gentle smoke with a lingering and creamy vanilla sweetness. Deeply rich and intensely peaty, this Whisky hits all the senses with a rush of black smoke, creamy, nutty notes , and a tangy sea salt finish. Smokehead High Voltage is distinctive, explosive, and not for the faint of heart.